NEW ORLEANS, Louisiana, January 14, 2014 (ENS) – The Fifth U.S. Circuit Court of Appeals on Friday upheld a lower court decision approving a multi-billion dollar settlement with oil giant BP of private claims arising from the April 2010 Deepwater Horizon oil spill in the Gulf of Mexico. The split three-judge panel dismissed BP’s argument that the settlement agreement should be thrown out because the U.S. Constitution prohibits paying claimants who have not suffered an injury, or cannot prove their injuries were caused by the spill. The panel said U.S. District Judge Carl Barbier was correct in his ruling that the plaintiffs who filed a class-action lawsuit against BP alleged that they were harmed by the spill, and that was all that was required to certify the class and approve the agreement. In its appeal, BP attorneys argued that the administration of the 2012 settlement agreement was wrong because it permitted claimants without actual damages to join in. BP contended that claimants should not be paid for fictitious or wholly non-existent losses. BP had originally estimated that it would cost $7.8 billion for this settlement but revised the estimate upward to $9.2 billion in late October. Among the claims to which BP objects is one for $21 million from a Louisiana rice mill located 40 miles from the Gulf Coast that earned more in 2010 than in any of the three previous years. Last July, BP launched the Gulf Claims Fraud Hotline “to help protect the integrity of the claims processes” relating to the Deepwater Horizon oil spill. 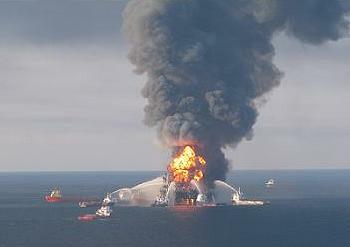 BP pointed out that the Gulf Coast Claims Facility’s fraud detection program enabled it to identify more than 7,000 claims as “multi-claimant scams or even efforts at criminal fraud.” The GCCF referred more than half of these to the U.S. Department of Justice for criminal investigation. BP still faces fines under the Clean Water Act and has set aside $42.4 billion to cover the cleanup, compensation and fines. WASHINGTON, DC, January 14, 2014 (ENS) – During a news conference today, Senators Barbara Boxer, California Democrat who chairs the Senate Environment and Public Works Committee, and Sheldon Whitehouse, a Rhode Island Democrat, announced the members of a newly formed Senate Climate Action Task Force and discussed their plans to take action on climate change. Of the 19-member Task Force all but two are Democrats and those two are Independents. No Republicans have joined the Task Force. “More than 700 companies that drive the U.S. economy – including Microsoft, Owens Corning, General Motors, the Portland Trail Blazers and candymaker Mars – have signed a declaration calling for national action on climate change. This is a remarkable shift in how some of the nation’s biggest corporations view the threat posed by climate change. Policymakers should take notice,” write Boxer and Sanders. On Thursday, Boxer will chair a hearing of the Senate Environment and Public Works Committee to examine federal efforts to address climate change as provided for in the President’s Climate Action Plan. The Committee will hear from the Environmental Protection Agency, the White House Council on Environmental Quality, the General Services Administration and the Fish and Wildlife Service, among others. Governor Cuomo named former New York City Police Commissioner Ray Kelly as special advisor On New York emergency preparedness. “After what we went through we literally have to reimagine New York because all the rules all the theories are out the window and it is now through the experiences, reimagining how New York should be built,” said Cuomo. The state will spend $5 billion of $60 billion in supplemental funding approved by Congress after Hurricane Sandy on preparing the public transit system to withstand superstorms, said Cuomo. “We have to totally harden our transit system,” said the governor. “When we built the New York City transit system we didn’t envision floods that could fill the subway system. The tunnels are open, the subway entrances are all open, and in a situation like Sandy that just created tremendous flooding. We now have to re-imagine the subway system where you can close all of those openings, and we’re going through that with a $5 billion massive plan,” he said showing a picture of an experimental inflatable plug that is inflated to plug a subway tunnel to keep the water out. “We will open a new spur for the Metro-North Railroad to provide more resiliency and direct access to Penn Station, which will also at the same time build four new stations to bring transit options to the Bronx,” said Cuomo. NEW YORK, New York, January 14, 2014 (ENS) – The nine states participating in the Regional Greenhouse Gas Initiative, RGGI, today announced that the 2014 RGGI cap on carbon dioxide is a total of 91 million tons. This represents a 45 percent reduction to the RGGI CO2 cap. To further build on this progress, the RGGI cap will decline 2.5 percent each year from 2015 to 2020. By 2020, power plant CO2 pollution in the nine RGGI states is projected to be half of 2005 levels. The Northeast and Mid-Atlantic states participating in the second RGGI control period – Connecticut, Delaware, Maine, Maryland, Massachusetts, New Hampshire, New York, Rhode Island, and Vermont – have implemented the first mandatory market-based regulatory program in the U.S. to reduce greenhouse gas emissions. A CO2 allowance represents a limited authorization to emit one short ton of carbon dioxide, as issued by a respective state. A regulated power plant must hold CO2 allowances equal to its emissions to demonstrate compliance for each three-year control period. The first CO2 allowance auction under the new cap, and the 23rd RGGI auction overall, will take place on March 5. The states will offer for sale 18.6 million CO2 allowances using a reserve price of $2.00 for the March auction. There will also be a five million allowance cost containment reserve, CCR, available for this auction. This reserve will be accessed if the interim clearing price exceeds the CCR trigger price of $4.00. “The RGGI cap reduction, along with other changes to the program, will help the RGGI states further reduce carbon emissions while fueling clean energy economic development by funding investments in energy efficiency and renewable energy,” said Collin O’Mara, secretary of the Delaware Department of Natural Resources and Environmental Control and vice-chair of the RGGI, Inc. Board of Directors. “Last year, each of the nine states pledged to propose regulatory changes to lower the cap. Each state stepped up to the plate and got the job done,” he said. Having strengthened their successful carbon pollution reduction program, the RGGI states have submitted extensive comments to the U.S. Environmental Protection Agency describing why regional cap-and-trade programs, like RGGI, offer a simple, cost-effective way for states to comply with upcoming EPA regulations to cut CO2 pollution from existing power plants. “RGGI has once again proven that state leadership provides the laboratory for innovation,” said Kenneth Kimmell, commissioner of the Massachusetts Department of Environmental Protection and chair of the RGGI, Inc. Board of Directors. “RGGI is a cost-effective and flexible program that can serve as a national model for dramatically reducing carbon pollution for other states throughout the nation,” said Kimmell. SACRAMENTO, California, January 14, 2014 (ENS) – In the first poll to question Latino voters on the specific topic of coal exports to China, Latino voters surveyed were found to oppose new efforts to increase coal exports to China and Asia from the West Coast. As the United States considers expanding the export of coal to China, a clear majority of respondents rejected this proposal by a margin of roughly 6-to-1. Overall, 64 percent of Latinos surveyed said the amount of coal exported to China should be decreased compared to just 11 percent who thought it should be increased. Opposition to coal exports was consistent across party affiliation. Coal burning accounts for 20 percent of global greenhouse gas emissions. China has increased coal burning so rapidly that the country now burns as much coal as the rest of the entire world combined. In order to reach this expanding market, the coal industry in the United States wants to quadruple coal exports to China from 35 million tons to 140 million tons. On behalf of the Renewable Energy Accountability Project, REAP, the Latino Policy Coalition/Latino Decisions poll asked Latino voters a specific question about the new export policies under consideration. By a 2-to-1 margin, respondents said they would support a new export policy to curb the shipment of coal from the U.S. to China and other Asian markets from West Coast ports. Overall, 59 percent of those questioned said they would support new export policies to stop coal exports to China and just 27 percent said they would oppose such a policy. On October 29, 2013, Oregon and Washington agreed to put a price on emissions of the greenhouse gas carbon dioxide, aligning their policies with those of their neighbors California and British Columbia. The agreement was reached as part of a broader deal to combat climate change among the U.S. Pacific Coast governors and the premier of British Columbia at the Pacific Coast Collaborative leaders’ forum in San Francisco. Pantoja is referring to a 2013 survey in which Latino Decisions found that 84 percent of Latinos favor the EPA setting more strict air pollution safeguards and 86 percent would support the President using his executive authority to set promote rules that limit carbon pollution. The findings from today’s poll release confirm Latinos general support for environmental protection and opposition to carbon pollution.